Since it's sukkos time again, I couldn't resist posting the trailer for this special, funny movie. Yaakov: Are you looking at the Danish goyim again? Me: Well I am looking at Mary. She's beautiful. Yaakov: (squinting at screen) You think she's beautiful? I don't find her attractive at all. Me: Are you on drugs? She's the most beautiful woman in the world. Yaakov: (shrugging) I don't think she's that attractive. You're better looking than that. Me: Yaakov, She's married to the prince of Denmark. He could marry anybody. There's a reason why she's the princess. Yaakov: Well you're my princess. I give you all a brocha that your husbands are as blind as mine. After teaching today, I tripped and fell. Right in front of three guys who were building the hebrew school's sukkah. I was in terrible pain. I wanted to stay on the ground and cry, but I couldn't - too embarrassed. I couldn't let them see my pain and suffering. I got up right away. "I'm okay," I laughed nervously, feeling like a total moron. Meanwhile, I scraped up my left knee, my right elbow, and both hands. Would it have been so bad to just lay there and cry? There's a pervasive idea in our society that everything is okay. You like it? Do it! It feels good? Do it! Not hurting anybody? Do it! I think we're experiencing moral decay in modern times, and a majority of it stems from this laissez-faire attitude. There's also a blurring of what's right and wrong. Intermarriage is a product of all this. There's an idea in yiddishkeit that if you keep commiting a sin, there's a point where you start rationalizing it as a mitzvah. That's my view on what intermarriage has become. There are books about it, websites about it, support groups for it. I think the current intermarriage figure in the U.S. is around 50% (correct me if I'm wrong here). 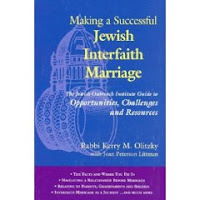 Intermarriage has become a mitzvah! I'm not thinking of the holocaust, as one anonymous commenter mentioned. That never entered my mind. What I am thinking of is what it means to have a soulmate. I'm thinking about Jewish children. I'm thinking about doing the right thing. I don't think intermarriage truly benefits anybody. I have so many ideas about this, so many feelings. I don't even think I can clarify them all. A blog is a monologue - it takes dialogue to work out the heavy stuff. I was on the phone with my father yesterday. Apparently, there was a time when my cousin was briefly courted by a non-Jewish man. This was like, 30 years ago. Anyway, my uncle (her father) told her, "It's him or me." She chose her father. He told me another story about a Jewish guy he knows, in his 80's. This guy married an Irish Catholic girl, and his entire family cut him off. He was married to her for many years, and raised a family with her. Yet he never got over losing his parents and siblings. I asked my father, "Why did he take up with this girl in the first place?" "Well, he loved her," - as if that solved everything. I don't buy that crap. You don't just love somebody. You don't get involved with whomever you please, no matter how attracted to them you are. She should have been an automatic NO. You know, Yaakov and I are ba'alei teshuva. We remember (fondly!) what a bacon double cheeseburger tastes like. Are we going to Burger King? No. Very nice, you say. But a comparing love to a burger? The bottom line is the same: Some things you just can't have. Me: Chaya, how are your new shoes working out? Me: We can thank G-d for providing us with the shoes. Yaakov: I didn't know G-d worked at Wal-Mart. Yaakov: He works in a factory in China, too? Hebrew school was great. I gave it my all, and the kids had a blast. I planned a lot beforehand, so we had lots of projects to do. Thank you, Mrs. Stein, for providing art supplies! I taught the children the story of Yonah, and about Yom Kippur in general. Each child had a chance to say something s/he was sorry about. One boy said, "I'm sorry I threw that book and hit mommy in the eye." (!!!) I was very proud of the letter I sent home to the parents. We really covered a lot of ground! Rosh Hashana was amazing, I feel I accomplished a lot on a spiritual level. I daavened a lot and praised G-d at every available opportunity. The first day I daavened with a friend at her house, and the second day Mrs. Stein opened her home to mommies and kids. We all helped each other out, and we all got a chance to daaven. (I'm hoping Mrs. Stein will do it again for Yom Kippur!) AND...Not only did the honey cake not flop, but it came out AWESOME. I got so many compliments on it! I baked one for the family we ate with on Friday, and they went nuts over it. I say this with humility, because I truly feel it was the recipe. Every time I got a compliment, I gave mad props to the recipe. And the best part? I found it online! To sum up New York: busy and exhausting. Dad was totally nutty, but loving and generous as well. For awhile, I felt guilty feeling uncomfortable around him when he was so very giving. But then I decided it was okay: I can celebrate my Dad and his largesse, and I can feel awkward when he's acting foolish. That's life. The crowning moment was in Penn Station: Dad was instructing the bucket drummer how he could be doing his gig better. When our train arrived, he jumped up and down and yelled; "Baruch Hashem! Hallelujah!" over and over again. This wouldn't have been so bad if it wasn't in front of a crowd of Israeli bochurim. What can I say? I love my father. It's 5 a.m. - I start a job teaching Sunday school in 4 hours. I have to be perky for 6 year olds, and I haven't slept at all. September 11th, 2001 found me barefoot and pregnant with Rivky. I was in the kitchen, washing dishes (because when you're barefoot and pregnant, you have to be in the kitchen). My friend called me up, sobbing about a bomb. She was walking across the bridge, leaving Manhattan. The cell service was lousy, and I wasn't understanding her well. I thought she said her husband got caught in a bomb scene. "Are you saying Shalom's work was bombed?" "No No, the World Trade Center was bombed." At that point she didn't know the story, and I didn't either. Yaakov came into the kitchen, and we turned on the radio. We listened incredulously as the story unfolded, as the towers collapsed. I look back and I marvel how I experienced that event without television. I remember sitting on my rooftop, watching the smoke rise from Manhattan. I remember looking at the sky, a sky without planes. I remember walking out of my apartment and seeing police cars. I remember walking to my friend's house, when she finally made it back to Crown Heights. It seems like each year I've seen or learned a little more about that terrible day. What really gets me is the rawness of it all. Seeing video footage and hearing people freaking out. Women screaming and crying. Men yelling and cursing. Normal people reacting to a most abnormal situation. It is their voices that make September 11th real to me. Crown Heights was a total whirlwind, my dad was off his rocker, I just got home today, and I'm exhausted. When I'm less tired, I'll tell you about the freakazoid who sat next to me on the plane. Now I have to plan for Rosh Hashana. I must be on crack - I'm making honey cake again. We went to Dr. F today. This was my first time meeting him. He has a Spanish name but he looks Asian, which was interesting. Dr. F asked Srulik to open his mouth, and Srulik unleashed his tongue like a liberated gargoyle. "Did you know Gene Simmons was your patient?" I joked. 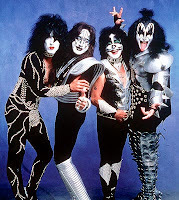 "Yeah, I heard a few of the guys in KISS were Jewish," Yaakov rejoined. "I didn't know you guys were KISS fans," he said. "Why do you think my husband always wears black and white? It's in perpetual homage to them." "Are you guys orthodox?" (gee, how could you tell?) "Yes." "Well, I sorta have a Jewish home." he said. We didn't follow up on that one, but we were curious. He basically said that the prognosis seemed good. Srulik hasn't regressed, and he hasn't had another seizure. So that's good. Of course, the EEG still shows occipital abnormality, so we can't be sure what the future holds. We just have to keep an eye on him. If he has another seizure, he wants him on medication. We told him we were disappointed that it took so long to return our calls. He blamed his faulty secretary, whom he has since let go of. I don't think that's true, but whatever. Things are stable, so I'm not overly concerned. We may get a second opinion in the future, but it doesn't seem necessary right now. p.s. We're not really KISS fans. No, really. So my dad is bi-polar, right? Well he's been crazy manic lately. This morning, for example: he called at 8:30am (5:30am his time). It was a non-stop stream-of-consciousness monologue. He went on and on over the practical joke he played on his buddy yesterday (he called him up posing as a Citibank employee, giving him a trumped up story about his credit card). Yep, that's funny, Dad. Then he decides he's going to play his oldies rock-n-roll CD for me realllllly loud. "DAD, isn't it 5:30am by you?" "Oh yeah. My wife's gonna kill me. She's sleeping in the other room. 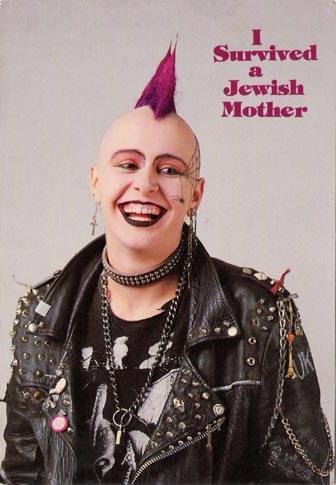 Hey, you know your father's a meshuggener. We're cut from the same cloth! You've got a crazy streak in you, too." That's technically correct: He's bi-polar and I have an anxiety disorder. But only one of us is crazy, and it's NOT ME. I'm going to New York next weekend. I usually go erev rosh hashana - to celebrate my birthday, see friends, visit my Rebbe's kever. I decided I was going to visit my aunt and uncle in Jersey on Sunday. That's my dad's sister and brother-in-law. I made arrangements with my aunt about a month ago. Well, when my father found out, he decided he's going to meet me in New York. I've been having mixed feelings about this since he informed me. My dad is hard to manage even when he's on an even keel. He's like an 11 year old in a 64 year old body. I can just imagine meeting him at JFK. Then there's the fact that this is MY vacation! When I go to Crown Heights, I like to run around, visit my friends, etc. I don't like having to be responsible for another person. So there's mild frustration over that. But then I thought, I can't afford this trip anyway. Maybe he'll pay for cabs and train fare. That makes me feel guilty. Another aspect is the fact that he's manic right now. Will he be like this in Crown Heights? Will I have to introduce my crazy father to all of Kingston Avenue? Will he regale our shabbos hosts with his practical joke stories? And there's more - sometimes after a manic swing he'll get very depressed. What if he bails out on the trip? He's done that before. After we got off the phone today I thought, "Maybe I should tell him he needs to see his psychiatrist." I don't know if that's an appropriate thing to say. I also don't think my intentions are pure. Is it fair to tell him to see his doctor just so I can feel comfortable around him? I just want him to be normal when I meet up with him in New York. I feel like I can't deal with him otherwise. I'm selfish. I admit it.